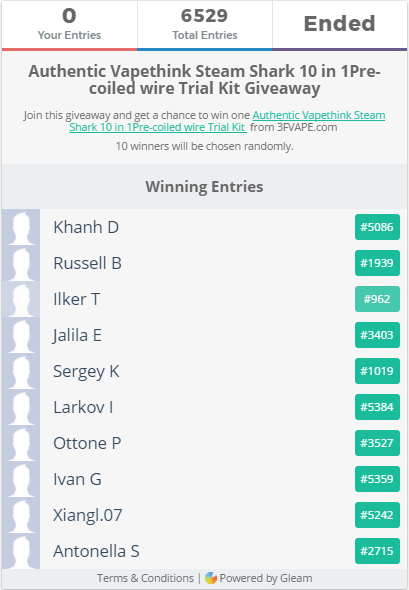 Присоединиться Authentic Vapethink Steam Shark 10 in 1 Pre-coiled heating wire Trial Kit Giveaway Теперь, 10 победителей будут выбраны случайным образом. The Authentic Vapethink Ten-in-One Kanthal A1 Pre-built Coils Trial Kit включают 1 x Bird's Nest Coil (0.2 ohm), 1 x Staggered Coil (0.25 ohm), 1 x Half Staggered Coil (0.3 ohm), 1 x Staggered Fused Coil (0.4 ohm), 1 x Staircase Coil (0.3 ohm), 1 x Staircase V2 (0.7 ohm), 1 x Juggernaut Coil (0.55 ohm), 1 x Super Juggernaut Coil (0.35 ohm), 1 x Super Clapton Coil (0.6 ohm), 1 x Taiji Coil (0.45 ohm). 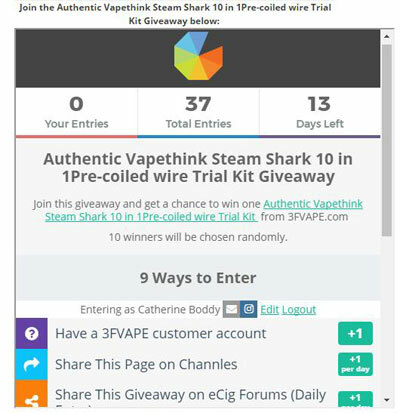 It's a great honor to be here to publish the final result of the Authentic Vapethink Steam Shark 10 in 1 Pre-coiled heating wire Trial Kit Giveaway. If you failed to win this giveaway ,don't feel pity cause we would launch several other giveaway activities in the nearby future. And here we got an other giveaway for the Authentic KAEES Solomon RTA Rebuildable Tank Atomizer,which have not ended yet.